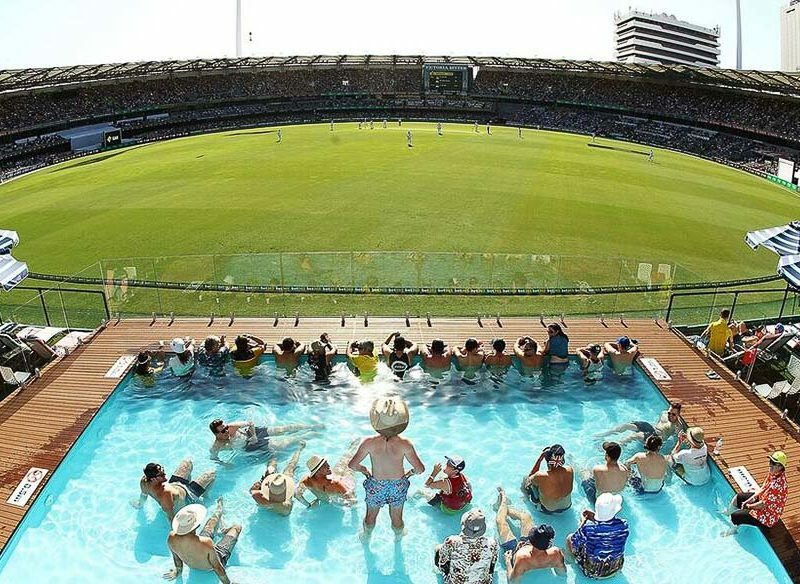 Watch the cricket in style at the Gabba, Brisbane. Brisbane sizzles in summer but, there’s plenty of cool spots for a hip dip. Here’s 8 swimming venues of note, each with its own story to tell. If there’s anything a Brisso loves more than the cricket in summer, it’s a swim, and this crazy concept combines the two. 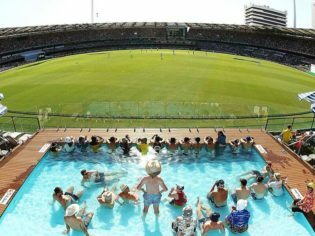 Head to Queensland’s cauldron of cricket at the Gabba – in Woolloongabba – and catch a game or two, while cooling your heels in the pool deck. This pop-up six-by-eight metre tiered pool, boasting two large decks with seating, tables and shade, can accommodate 140 people at any one time. But entry to the deck is by invitation only with fans encouraged to come to the match in their best pool attire and share it on social media. Dive into history at the Spring Hill Baths, not only Brisbane’s first in-ground pool, built in 1886, but the oldest surviving of its kind in the Southern Hemisphere. This heritage-listed facility exudes old world charm from its classic Victorian-era change rooms and grandstand seating. The pool itself measures 23.5 metres long, and offers everything from lap swimming to aqua aerobics classes. Brisbane residents and visitors may think they know everything about the iconic Streets Beach at South Bank but did you realise it’s Australia’s only lifeguard-patrolled inner-city beach? Once the mercury rises, watch locals and tourists flock like seagulls to this bathing beauty in the heart of the Queensland capital. Flop and drop under the tropical palm trees or grab the kids and indulge in the educational Aquativity programs on offer here. Australia’s first hi-tech hotel, plonked in the middle of the CBD, also boasts one of its most glorious pool terraces. Brisbane’s beautiful people like to come to NEXT hotel and swan around its Pool Terrace for after-work drinks designed by some of the city’s most clever cocktail movers, groovers and shakers. Stay in this hotel, replete with sleep pods, and float in this pool while Brisbane buzzes below. You could be forgiven for thinking you were in LA, not Brisneyland, when you arrive at the Soleil Pool Bar at Rydges South Bank. Here, it’s all timber blended with a gold and white palette, and DJs designed to recreate a pool party atmosphere. There’s also a giant LED screen embedded into the ceiling and an uber trendy tapas, garden tea and cocktail menu. One of Brisbane’s first bars to take the plunge by going rooftop, Limes Rooftop Bar in Fortitude Valley keeps its cool in summer with some perky plunge pools. Take a dip here, or attend its open-air night cinema to catch a flick and a capture a cool breeze. Sip on a ‘summertime jug’ of Rooftop R&R which includes gin, rose, raspberry, lemon and tonic. Les Bubbles Bath House is a bar beneath a restaurant in Fortitude Valley that has a dubious past. By its own admission, Les Bubbles Bath House is “drenched in sordid history” dating back to Queensland’s corrupt cops in the ’80s. These days, this notorious bath house is a bar beneath a restaurant in Fortitude Valley. But wait, there’s more. Check out the 15-person spa bath. Paying homage to its seedy history of bribes, illegal prostitution and the like, order a cheeky cocktail such as the Hush Money or Liquid Misconduct. The UQ Sport Aquatic Centre along the Brisbane River at St Lucia has seen it all. Swamped during the 2011 Brisbane floods, it was rebuilt, with a twist. Said to measure the standard Olympic 50 metres, rumours have emerged that it’s actually centimetres short of the mark. Not that it matters. Open to the public, swim in this sparkling open-air pool, with landscaped gardens, on the grounds of the University of Queensland. Further $3.4 million upgrades in 2017 mean a new 25-metre heated pool has also been added to this facility, which offers a range of aqua activities as well.